Copyright © 2010 Eric O'Connell gallery911.com. For entire set of images and full proposal, please download pdf here. IMAGE SIZES: Silver gelatin prints appx. 100 centimeters longest side. The projections will be wall-sized, based on distance from projector to wall, and wall height. SPACE REQUIREMENTS: Negotiable; Please see the mockup floor plan, which estimates a space 34′ x 42′; totems are movable, and will also house the projectors. 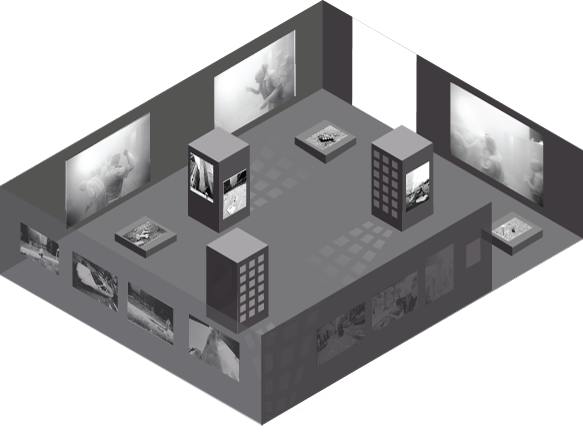 Spaces with limited floor plans could house a singular video installation, which would be a running loop of all the images with the soundtrack. SOUND DESIGN: Running loop designed by Patrick Knipe. My world was abstracted in the moments of chaos that I photographed before and after the towers collapsed. The familiar – my downtown, my neighborhood, and the streets on which I ride my bike – became the unfamiliar. Both unsettling and beautiful, these photos – photos of destruction and death – I believe are proof positive of Klee’s theory. The horror and destruction of the event that I remember, were the catalyst for this abstraction. The tragedy of 9/11, regardless of political orientation, brought people together – nations, states, cities – and especially New Yorkers helping New Yorkers. By all accounts it amplified our humanity. For weeks after, strangers appeared to have known each other for years. In this there was also an incredible beauty. A body part separated from its corpus becomes a grotesque object of abstraction. Removed from the corporeal, and abstracted by its placement in the world, it becomes an allusion to what is usually left unseen – this is what bombs produce. The horror and shock of the juxtaposition makes us more aware of our humanity, and vulnerabilities. The abstract scenes of papers and debris, shoes, people out of place, or the very chaos of the moment transcend the safety of a gallery or exhibition. It is a matter of degrees and both experiences contain the strange inner space of calm one might experience during a confusing and out of control event. In 1915, the artist Paul Klee said, “The more horrifying this world becomes (as is the seeming trend these days) the more art becomes abstract; while a world at peace produces realistic art.” His words seem prophetic today, and he might be right. This exhibit is about memory and experience – the phenomenological experience and remembrance involving sight and sound before, during and after the towers of the World Trade Center fell. The movement through the exhibit is at first, somewhat and purposely disorienting. The images are hung on two walls, and on two sides, of three, square totems standing in the floor space. Images are hung on the totems often at unusual heights to reflect the vantage point in the actual photo. On the two walls are projections, which will loop at disjointed intervals a series of images taken after the first tower fell and the air was thick with dust creating a dreamlike haze. On the floor are mounted three images, life size to the objects contained within them. They are mounted parallel to the floor and you must also look down to investigate. I want to offer 1) a very literal version of my experience and 2) an uncomfortable experience in the context of a gallery setting by upsetting the traditional formal placements for images in a photographic installation. One side of the totems will have mirrored panels installed reflecting projected lights from above; we will be able to simulate the abstract light patterns that sunlight often projects onto city streets. The walls and totems become a boundary blocking escape. Like skyscrapers in a city, it forces navigation through a given space. The experience of viewing the images and coming into contact with other visitors in a dark exhibition space enhances the phenomenological experience. The sound track is an important part of the exhibit. Reason, logic and imagination overlapped, often meshing into disorder. We intend to create a soundtrack from my memory, which the viewer will hear as they walk through the space. It isn’t meant to be a cinematic score, it’s meant to serve as a soundscape from the experience I recall. It’s purpose isn’t to glamorize or evoke a contrived emotion, but to add another level of distraction and sensory experience.